Q How do you change the bulbs and what is the diameter of the base? 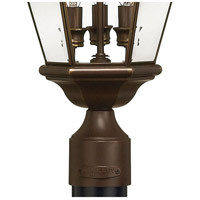 The Hinkley Lighting Clifton Park 3 Light Outdoor Post Lantern 2421CB has a door on the fixture that opens to change the bulbs. This fixture has a 3" fitter. Q What is the correct pier mount (model and color) for this light? 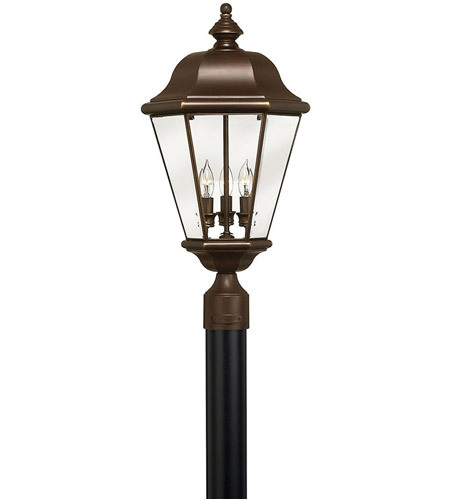 A The Hinkley Lighting Clifton Park 3 Light Post Lantern (Post Sold Separately) 2421CB can use this matching pier mount 1308CB. 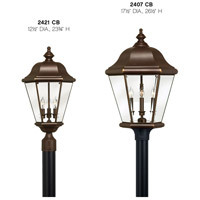 Q What is the cost of the post for 2421CB, for Clifton Park 3 light post lantern? 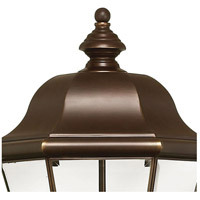 A The Hinkley Lighting Clifton Park 3 Light Post Lantern (Post Sold Separately) 2421CB can use the Hinkley Lighting Post Base in Black 6660BK. The factory does not produce a Copper Bronze pole to match.